While we at Shoeboxed take great pride in serving customers across the country and around the globe, any member of our team can attest that many of the company’s oldest and most loyal clients can be found within a ten-minute walk of our Durham office. Like us, local residents such as Stephen Peters not only share a passion for organization, but also a genuine love of the Bull City. It was truly a unique pleasure to sit with Mr. Peters in his quaint woodshop and chat with him about his shop, life in Durham and his experience as one of Shoeboxed’s oldest customers. Stephen Peters, a local Durham professional woodworker and proud owner of Peters Design Works, has a unique relationship with Shoeboxed that began when we were still a budding technology startup. 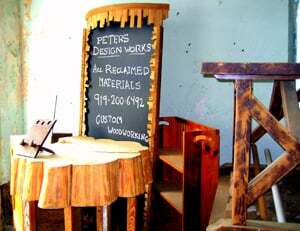 Since the 1990’s, Peters’ unique workshop has found a happy home in the heart of downtown Durham and has been providing the greater Triangle area with breathtaking, custom furniture and renovations ever since. 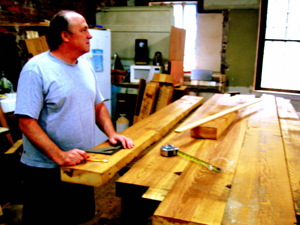 His specialty craftsmanship includes residential, commercial, and eclectic furniture constructed from the reused, salvaged, and antique. A resident of Durham since the 1980’s, Peters and his wife have enjoyed watching Durham’s revitalization and urban development over the past decade. In particular, over the past few years, the Peters have watched Durham develop into a buzzing technology hub within the Research Triangle Park—a hub that also became our home in 2007. When Stephen Peters stumbled upon Shoeboxed, coincidentally located just down the street from Peters Design Works, he decided to give our service a try. And we’re thrilled that he did! Three years and countless receipts later, Peters’ business continues to flourish and Shoeboxed is honored to help keep his small business organized. Perhaps even more notably, Peters is infamous around Shoeboxed HQ as the only customer to date who has hand delivered his paper clutter to our office for processing and organization! Cheers to a painless audit! 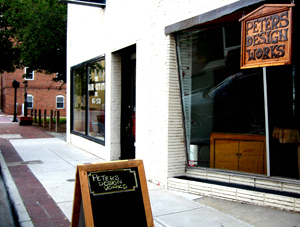 After Peters Design Works was audited in the early 2000’s, Peters decided that it would be wise to begin keeping better track of his business documents online. That way, all of his tax records and receipts would never be lost, and even better: he could easily keep all of his documents organized. Peters knew that having access to all of his receipts online would not only give him peace of mind should he ever be audited again, but also pointed out that digitizing all of his receipts and business documents would “make the auditors’ job easier”(what a guy!). And so began Peters’ search for scanners, receipt scanning services, and organizational tools. As fate would have it, it didn’t take too long before Peters stumbled upon Shoeboxed, a brand new online receipt management service that was not only offering the exact service he was seeking, but also physically located right down the street from his workshop. He didn’t need someone to tell him this was a match made in heaven and Peters soon signed as one of Shoeboxed’s earliest users. Subscribing to one of Shoeboxed’s original unlimited plans in early 2008, Peters has since been “grandfathered in” and continues to enjoy an unlimited supply of our infamous blue envelopes to this day. For a small business owner and fellow Durham resident who has supported us from the beginning, we feel like it’s the least we can do! As Shoeboxed’s service has improved and evolved over the years, so has Peter’s productivity. Today, Peters not only enjoys our mail-in service on a regular basis, but also takes advantage of some of Shoeboxed’s partnerships and integrations in his day-to-day life. Peters told us that he uses Shoeboxed with both Evernote and Mint to have an even more accessible database at his fingertips—a database that he can immediately generate into expense reports as needed. For Peters, using Shoeboxed wasn’t only about about removing paper clutter from a disorganized office; it was the idea that a stack of paper and receipts seemed a lot easier to manage (and produce immediately, if necessary) when it was organized online instead of in a filing cabinet. With the paper clutter from his small business now available on Shoeboxed.com, Peters is not only ready should the auditors ever come knocking, but more importantly is back to focusing all of his time and energy on his passion: saving and restoring the craftsmanship and aesthetics of Durham’s rich history. Following our pleasant chat with Mr. Peters we were fortunate enough to spend a few minutes perusing his workshop and admiring many of his current projects and recent renovations. 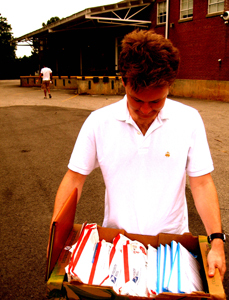 It was at this time that, seemingly wanting to cement his place in Shoeboxed history as the only customer to hand deliver paper clutter to our office, Mr. Peters asked us if we would mind taking a large container of paper clutter back to Shoeboxed HQ with us. As a company that takes customer service very seriously (even when we’re off campus), we were happy to save Mr. Peters a trip to our office and gladly loaded his paper clutter into our car! Which got us thinking… Perhaps Shoeboxed should invest in a company car and driver to make paper clutter house calls? What do you think about that? But in the meantime we will continue to look forward to Mr. Peters’ visits to our office, receipts aplenty, and can’t wait to see more of his marvelous renovations throughout the Bull City! I am in favor of a company car. Now the question is, are we going for speed or comfort? Tax Question: Independent Contractors or Employees?